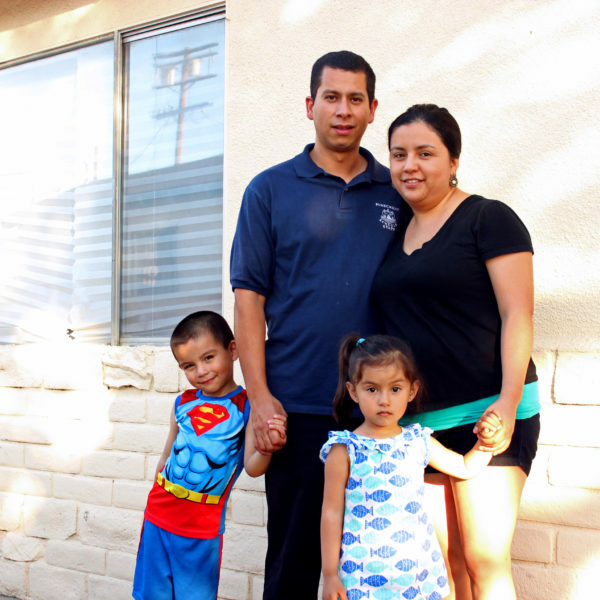 The Martinez family bought their house in Pacoima to be close to the things most important in their lives: family, friends, work, and convenient transportation. The tight knit family of four (they have a young son and daughter) lives in a humble 1950’s ranch style home. He is a school bus driver for a San Fernando Valley Catholic school and she is a dedicated stay-at-home mother who is involved in her community. After immigrating in their teens from different small towns in northern Central Mexico, Sergio and Rosa wound up settling in the northeastern Valley. Their extended families already lived here, cementing their roots within the Valley’s familiar desert small town vibe. While house hunting, the first and only house they came across appealed to them as a perfect place to raise their kids. They immediately put an offer down and bought it, making it their home and refuge in the midst of urban Pacoima. In the beginning, the young couple struggled to pay their mortgage and needed DWP bill payment extensions. They also enrolled in DWP’s low-income discount program. The thrifty parents see from firsthand experience why conservation and energy efficiency affect their bottom line. They currently make extensive use of fans as they have not been able to afford air conditioning. This is intense as their house is poorly insulated and temperatures in their neighborhood can spike in the hundreds during heatwaves. With bills averaging over $300 in the summer, they’re truly feeling the heat. The Martinezes want to conserve more, to learn about clean energy, and eventually to install energy efficient appliances and drought tolerant gardens. Yet they say that these types of improvements still aren’t affordable enough. For example, many of their neighbors haven’t been able to upgrade their homes to be energy efficient; and only one of their neighbors actually owns solar panels. “We can’t actually install solar on our house. Aside from the high cost, our neighbor has planted a row of trees on the side of the house, which blocks the roof from getting full sun,” says Sergio. The Martinezes, however, have recently started to get more involved in improving their community’s environmental conditions, first through attending High Speed Rail planning meetings and then by joining Pacoima Beautiful, a community organization working on environmental issues. They’ve helped craft the Community Solar messaging and outreach for Repower LA’s campaign through participating in one of its focus groups. There is pleasure for them in becoming more informed and involved residents. It’s also deepened and created a new layer in their marriage: “This is a great new thing for us to do as a couple,” adds Rosa. Their need for economic incentives and environmental consciousness makes the Martinezes perfect candidates for the Community Solar program. They would greatly stand to benefit from these programs that allow lower-income customers to be part of greening Los Angeles’ utility.